Classic Car Tours International was formed in 2001 by Brian Thorley, a Francophile, with a passion for classic cars and modern sportscars.A management consultant for over 30 years, his love of France, sports cars and classic cars goes back even longer; his first sports car, for instance, was a Swallow Doretti when he was still an undergraduate at Manchester University and in 1971 he bought his first Lotus Elan. Brian's other passion is France where he lives most of the year in the Dordogne region in south-west France. He formed Classic Car Tours International in 2001 whilst living in Cumbria's Lake District and regularly participated in classic car tours and rallies in the UK, as well as in France. 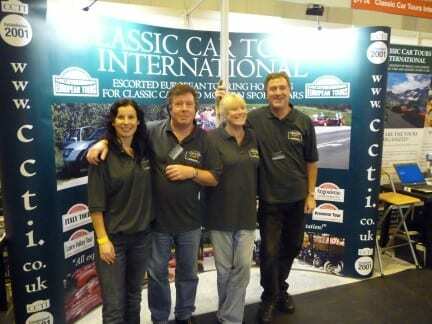 In 2001 he launched Classic Car Tours International,(CCTI), with their first European escorted car tour for classic cars and modern sports cars visiting both Spain and France. 17 years later CCTI are now one of the market leaders offering 9 fully escorted European car tours in 2018 with four tours linked to a motor race event, the other five are purely car touring holidays visiting some of Europe's most stunning scenery where you can drive your own car on some of Europe's best driving roads. Brian's intimate knowledge of France and his interest in French lifestyle has resulted in Classic Car Tours International incorporating stunning scenic routes through some of the prettiest villages in France as well as visits to many places of interest both on and off the beaten track.These include stunning chateaux, villas and interesting museums catering for every taste; beautiful gardens, art galleries,abbeys, churches and other historic monuments, wine caves and other fascinating visitor attractions. Brian also has a nose for discovering charming hotels and restaurants to enhance your driving holiday. As the Tour Director, together with his partner Karen, he accompanies all tours to guarantee the smooth running of the event and to ensure that new clients are made to feel at home and introduced to regular/repeat clients. We have no rigid policy regarding eligibility or age of cars on our car tours so modern sports cars, of any age, are equally welcome as older, classic cars. In fact over two thirds of our clients drive modern sports cars. We are a friendly organisation whose ethos is based upon enjoying your driving, whatever your vehicle, and this is a common theme amongst all our clients. Participants always have the freedom and flexibility to "do their own thing" each day as long as they arrive at the hotel in the evening where we dine together. A Tour Director always accompanies each tour so they are always there to sort out any little problem and to make everyone feel at home. Prepare to enjoy yourselves in friendly, like-minded company and have some fun ! Our tours are noted for their friendliness and everyone, from beginners to regular clients, are always made most welcome. As you can see from our client comments, there is a lot of laughter on our car tours, so come along prepared to enjoy yourselves and to have some fun!